Korg produce some of the most exciting and powerful synthesizers around. And whatever your price range, provide something for everyone. Whether you are dabbling in synthesizers for the first time or are an established producer, Korg will be one of the first names on your list. For NAMM 2019, they have released a new batch of exciting synthesizer models. Take a look at what makes each of these so special! Korg’s Minilogue, Monologue and Prologue have been nothing short of a sensation in the analogue synthesizer revival. Sleek and refined looks, easy-to-use intuitive controls and features, and above all incredible sound quality! These impressive synths have certainly left an imprint on producers everywhere. And now the Minilogue XD has the potential to blow them all out of the water! Taking the best bits of the predecessors, this iteration does it all. An improved 4-voice analogue circuit combines with the multi-engine featured on the Prologue, allowing you to plumb the depths of sonic exploration. There’s the improved 16-step sequencer and filter from the Monologue as well, letting you build complex polyphonic synth patterns. Powerful 32-bit floating-point effects let you modulate, delay and add reverb to your sound. 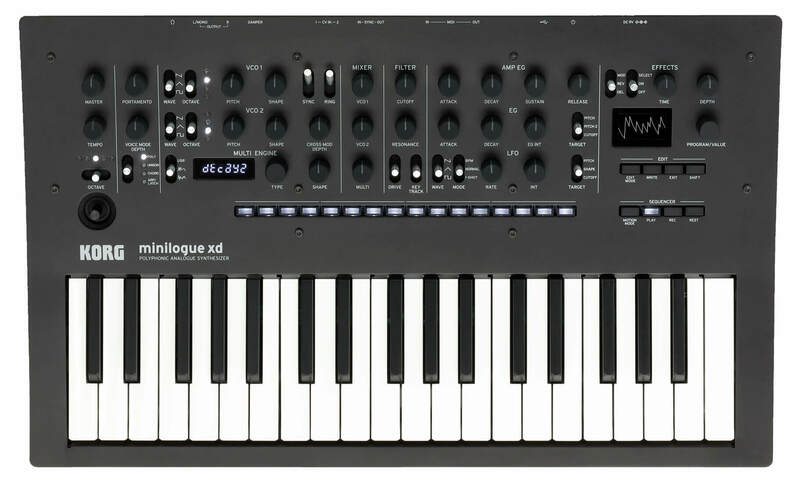 It doesn’t stop there – this synth includes CV connections, Sync I/O for other Korg gear, MIDI and USB ports for the ultimate connectivity. We think this is certainly the best of the bunch so far, and for the price you’ll struggle to find a better-sounding synthesizer with as much control and integration options! Some of the most exciting products in Korg’s offering, the Volca series are cheap and powerful. And thanks to their exceptional connectivity, the more you have in your collection, the more you can do. The Volca Drum is unlike most digital drum sequencers. It uses DSP analogue modelling, meaning you can sculpt your individual drum tones from a variety of waveforms and noise sounds. For the first time in the Volca range the Drum includes a custom LCD display, allowing you to quickly comprehend detailed settings. This is a great feature and really brings the controls to life! Modular synthesis gives you total control over your sound. Often reserved for much higher price brackets, Volca offer the Modular Synth to the average customer! With 20 cables and 50 patch points included, you can connect anything to anything. The ideal introduction for anyone wanting to start out with complex modular sounds, or by the same token could make a cool addition to an existing modular setup. A major refresh on the best-selling synth, the KROME focuses on packing the most usable sounds into an easy to use platform. Updated for the modern-day producer, KROME EX includes sounds that immediately fit into productions of all types. This is a music workstation keyboard for the gigging musician or producer, whatever your level. 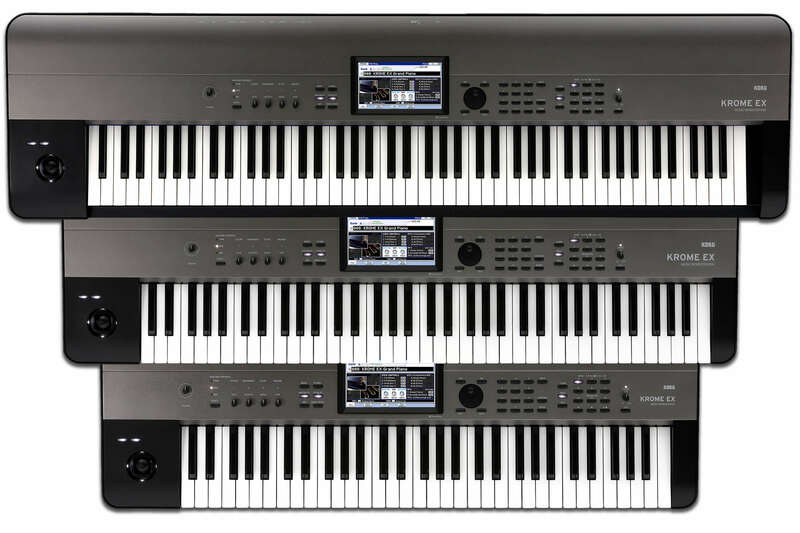 In a flashy new colour scheme, the Korg KRONOS2 SE takes the exceptional capabilities of the Korg KRONOS and expands them to new heights. The main addition is that of the Italian-made grand piano from the Korg Grandstage, as well as a heap of new sample libraries from KApro. The gorgeous color and sound delivered only by KRONOS will make an unmistakable difference on stage. KROSS 2, the long-awaited successor of the KROSS, is a compact, portable workstation with a huge range of sounds. Lightweight, portable and can even run on six AA batteries. This new model dramatically enhances KROSS’s sounds and functionality . In addition to a total of more than a thousand preset sounds, expansion PCM memory has been newly added. Also new is a pad sampler that allows full-fledged sampling, and USB audio/MIDI interface functionality. And the availability of the four show-stopping limited edition colours makes for a synth that will look as great on stage as it sounds!